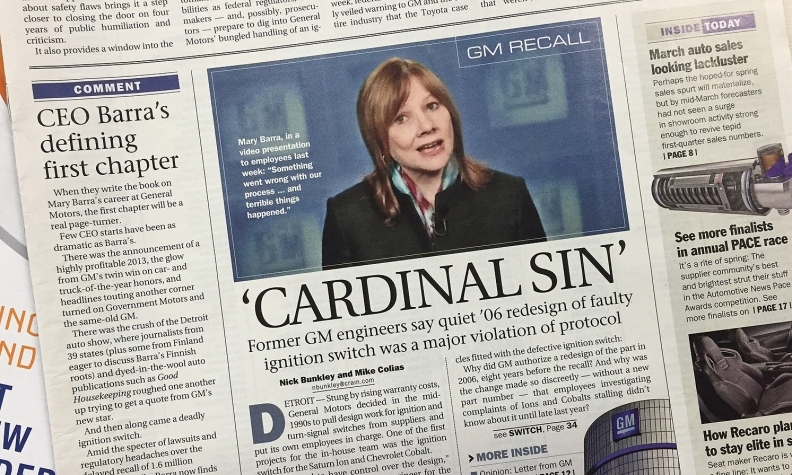 The Automotive News entry for coverage of GM's ignition-switch recall was selected as the best among winners in 22 categories and more than 500 entries in the Association of Business Information and Media Companies' annual journalism awards contest. NEW YORK -- Automotive News today won the Grand Neal Award for its coverage of the GM ignition-switch recall crisis. The Grand Neal, given by the Association of Business Information and Media Companies, marks the pinnacle of achievement in business-to-business media. It was the first time a Crain Communications Inc. publication received the honor. The Automotive News entry was selected as the best among winners in 22 categories and more than 500 entries in the annual business journalism awards contest. Earlier in the day, Automotive News won a Jesse H. Neal award in the Best News Coverage category for its work on the GM recalls. The awards honored the efforts of the following Automotive News reporters and editors: Nick Bunkley, Mike Colias, Gabe Nelson, Richard Truett, David Sedgwick, Shiraz Ahmed and Krishnan Anantharaman. Automotive News Publisher and Editor Jason Stein accepted the awards at a luncheon in New York.